Architectural Augmentations manufactures exterior fiberglass “FRP” entablature components: Cornice, Frieze, and Architrave to complement our architectural column line. Our moldings emulate the old world architecture of the Greeks using modern composite materials that last a lifetime. We have many standard profiles to choose from but our in-house mold making capabilities allow for custom profiles to be comparable in price. Therefore, we encourage architects and designers to pursue their envisioned designs or to maintain existing historic profiles for replication by us. Involving us early in the design process will iron out any kinks with the proposed installation method so please don’t hesitate to call or email. A typical molding is ¼” to ½” thick, 8’ long, and comes with a lap joint at each end for ease of installation from one piece to the next. Inside, outside, and custom corner pieces are available. 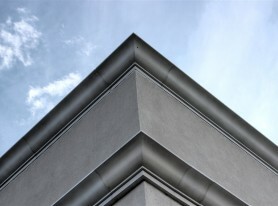 Fiberglass cornice comes standard with white marine grade gel coat or in any prefinished color, texture, or aggregate imaginable, which results in stone-like products without the added weight and high cost. The high percentage of fiber reinforcements yields a lightweight product that is stronger than steel. FRP offers the longevity that traditional products don’t and at lower prices, lighter weights, and easier installation methods. Traditional materials are significantly more expensive and demand a whole lot of structural reinforcement to install the products on a building’s facade.